Kan–geiko is a traditional training at the coldest time of the year, and through overcoming this hardship we start the New Year in the right spirit. Gothenburg Aikido Club has been organizing this New Year event for almost 30 years. Aikidoka from all over the world have been coming to practice Takemusu Aikido under the supervision of Ulf Evenås Shihan. Ulf-sensei will teach Takemusu Aikido, as learned directly from Morihiro Saito Shihan as his close student for 29 years.In 2019 Ulf sensei has been training Iwama Takemusu Aikido for 50 years! He will teach ken and jo, as described by Morihiro Saito Shihan in the five Mokuroku (transmission scrolls), and it´s variations, taijutsu from basic forms to ki no nagare, and explore the relationship (riai) between ken, jo and taijutsu. 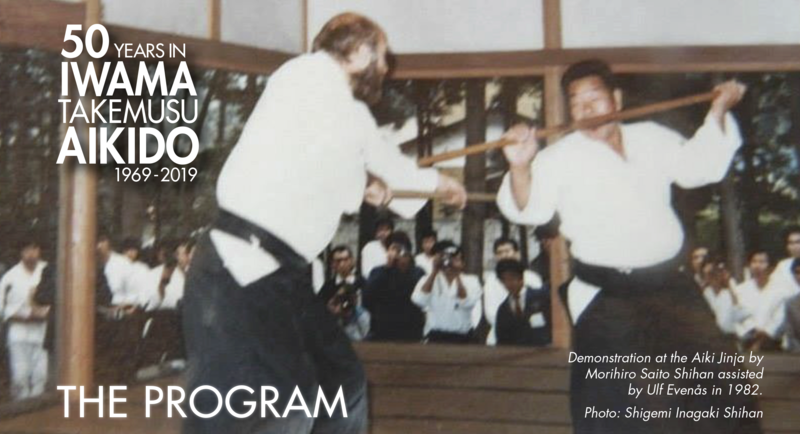 The seminar is open to everyone, regardless of rank or ”style.” Meet aikidoka from other countries, meet old friends and make new, and practice Aikido in the spirit of Morihiro Saito Shihan. The event will take place at Frolunda Judo Club, with 360 square meters of tatami, with a fully equipped kitchen. It is walking distance to a big shopping center, and the public transportations to the central part of the city are excellent. Following the seminar, there will be an Uchideshi week at Gothenburg Aikido Club, taught by top students of Ulf Evenås Shihan – Dan Borg 6 dan, Günter Annby 5 dan, Marijan Sprem 5 dan (all from Gothenburg Aikido Club), Johnny Sørensen 5 dan (Aalborg, Denmark), and Edgaras Indra 5 dan (Kaunas, Lithuania) will be teaching. Don’t miss this opportunity to practice with, and get to know, the new generation of international top instructors. Frölunda Judo Club, Klubbvägen 8, Västra Frölunda. 900 SEK (€ 100). Two days 600 SEK (€ 70) Payment before first training. Party: 160 SEK (€ 20). Notify participation when you register. Please inform us of any food restrictions, e.g. vegetarian, vegan, or other food intolerances. Frölunda Judo Club: 75 SEK (€ 10) per night. Bring sleeping bag. Gothenburg Aikido Club: 60 SEK (€ 6) per night. Bring sleeping bag. Bring bokken and jo. Participants traveling by airplane can borrow weapons. during the sessions is forbidden without permission. Uchideshi week It will be held at Gothenburg Aikido Club. For further information, see website & Facebook. Ulf Evenås is a 7th dan Aikikai Shihan. He also received 7th dan and was appointed Shihan (Takemusu Aikido) directly from Morihiro Saito Shihan, who also appointed Ulf-sensei as his personal representative. He also has a full teaching certification in Bukiwaza, the fifth level of the Mokuroku (transmission scrolls). Ulf-sensei is the head instructor of the Gothenburg Aikido Club, and one of the most qualified, and experienced, Aikido teachers in the world. The International Aikido Federation (IAF) uses Ulf Evenås as their representing Shihan, technical coordinator and demonstrator in major events such as IAF:s Congress and World Combat Games. Ulf-sensei has been teaching 800 seminars in 25 countries worldwide. Gothenburg Aikido Club started as a small group of enthusiasts in the late 1960’s, under the leadership of Carl Hansson (1910–1996). In 1969 the group became more organized and the same year it began with Iwama Takemusu Aikido, introduced by sensei Takeji Tomita. With 50 years of experience in Iwama Aikido, Gothenburg Aikido Club is the oldest existing Iwama “style” dojo outside Japan.